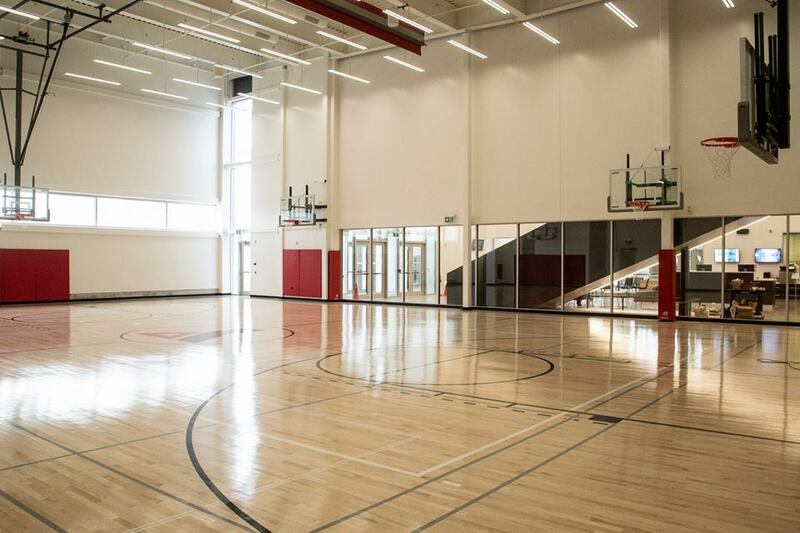 Wilfrid Laurier University students on the Brantford campus have experienced an athletic and recreational experience closer to that of a Waterloo student this past year as a result of the newly opened YMCA. The Laurier Brantford YMCA officially opened its doors on Sept. 14, 2018. The facility, which was brought to fruition through a partnership between Laurier and the YMCA of Hamilton, Burlington and Brantford, is open to both students and the community at large. Megan Jacklin, manager of inter-university sport and recreation programs on Laurier’s Brantford campus, said that prior to the opening of the Laurier Brantford YMCA, Brantford students were limited. “Unless you were a student here using the old Wilkes House Recreation Centre, there is a different level of appreciation for our new facility,” Jacklin said. Wilkes House Residence Recreation Centre, the only recreation facility which students formerly had access to, was small with minimal equipment. The new Laurier Brantford YMCA offers students with an enhanced, well-rounded recreation experience. The faculty offers large spaces, new equipment, multiple gymnasiums and studios and a unique range of classes. Furthermore, statistics show that of the 23,000 students that accessed the YMCA, 1,824 were unique students, suggesting that over half of the Laurier Branford student body has accessed the facility since September. “There’s even extra amenities that aren’t typically found in gymnasiums or health clubs like a student lounge that’s up here on the fourth floor or private meeting rooms that can be booked out for presentations or group projects,” Jacklin said. The Laurier Brantford YMCA features health and wellness specialists and supervisors that are present in the facility and offer three complimentary sessions to every student wanting to become familiar with equipment or for those wanting guidance on different workout routines. The facility also offers sport-leagues such as pickle ball, paddle and racket nights and more. Another unique amenity offered is child-care. “If we have any students at Laurier Brantford that require child-care, there is that opportunity through the facility and that is included in their membership if they would like to upgrade to a family membership for their family,” Jacklin said. The Laurier Brantford YMCA is also differs from the Athletic Complex, which is primarily used by solely students on campus — the facility is open to the community in Brantford, meaning anyone can buy a membership to the space. Providing students with an accessible, well-rounded facility for physical activity and recreational options is important to students on any campus. “I think nowadays you find that students are overloaded with external stresses and they’re just taking on more in their student experience, whether that’s academically or just personally in their social life and finding that it’s weighing a lot heavier on their physical and mental health,” Jacklin said. Jacklin explained that, before the Laurier Brantford YMCA was an option, students at the Brantford campus had a lower quality of athletic and recreational experience than what a Waterloo student may have experienced at the Athletic Complex. “The athletic complex in Waterloo, they’ve got that established fitness program, they’ve got the triple gym, they’ve got the swimming pool, they’ve got all of those facilities and fitness space and they’ve got segregated areas for women-only program whereas none of that was accessible at the old facility,” Jacklin said. Approximately 17,000 students attend Laurier’s Waterloo campus. In comparison, Laurier’s Brantford campus is home to only 3,000 students. “Now, I would like to say that we’re on par if not superior to what is provided to Waterloo students through the Athletic Complex. Our programs might be smaller in scale, and that’s just the nature of the different sizes of campus,” Jacklin said. Since the Laurier Brantford YMCA opened, 23,373 students accessed the facility. In comparison, Wilkes House Recreation Centre saw only 11,852 visits last year. “I think in comparison, the student body across both campuses are provided with a very well-rounded experience through the athletics and recreation department regardless of what facility they’re working out in,” Jacklin said.